In this experiment, see if your friends can guess how tall they are. You might be surprised by the results. Can your friends accurately guess their own heights? You’ll need to gather a group of 4 to 8 friends together. Don’t tell your friends what you’re going to ask them to do, or they might measure themselves beforehand! Get an adult to help you with this experiment. The adult can hold the tape measure, and if you need help writing notes, the adult can help with this too. Create a hypothesis, your best guess about what is going to happen. Do you think that your friends know how tall they are? If they aren’t right, is it because they think that they’re taller or shorter than they actually are? Give your friends some snacks and activities to do in one room. Tell them that they’ll go into the other room one by one, where you’ll ask them one easy question. As your friends come into the room one by one, ask each friend how tall he is. Show each friend an inch on the tape measure. Ask each friend how many inches tall they are. Write down their responses. If your friends have a hard time and say that they don’t know, show them how long a foot is, and ask them how many feet tall they are. After all friends have finished guessing, get them to stand up straight against the wall so your adult helper can measure and note their actual heights. Get your friends to play in a different room once each person is done, so that they don’t head back to the first room to let everyone in on the secret. What happens? Do your friends think that they’re taller or shorter than they actually are? Children will think that they are taller than they actually are. In the early part of their lives, children usually think that they are taller than they actually are. 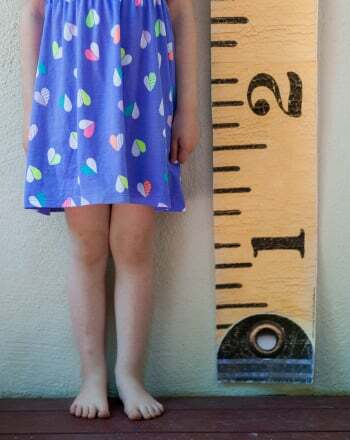 Even studies of shorter-than-average children show that they think that they are of average height. How tall you think you are depends on how happy you are with your height: if you're happy with your height, you will probably overestimate how tall you are. Younger children also have a harder time estimating measurements. When children turn eight or nine, they start to guess a little more accurately. However, even adults can be wrong about their own heights and the heights of others! There are many ways that you can change the activity to make if even more fun. You can ask adults to guess the kids’ heights. You can also get your friends to stand in a circle and look at each other. Later, talk to each one separately to see if they can guess who's the tallest, who’s the shortest, and who’s height falls somewhere in between. Do you think that they will guess correctly? Hunt, L, Hazen, RA, Sandberg, DE. 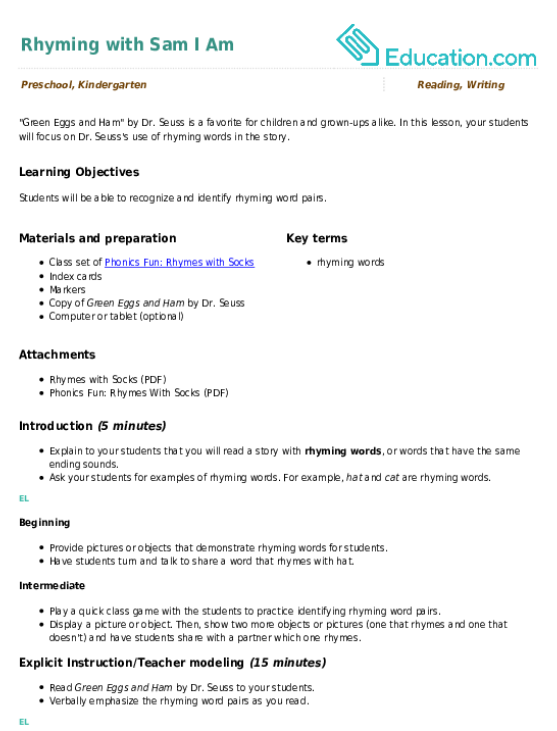 Predicted versus measured height. Hormone Research. 2000: 53(3):129-38. 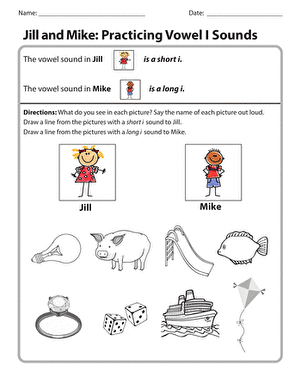 On this year two phonics worksheet, kids practise identifying the short "I" vowel sound by circling pictures. Then they write their own short "I" word. 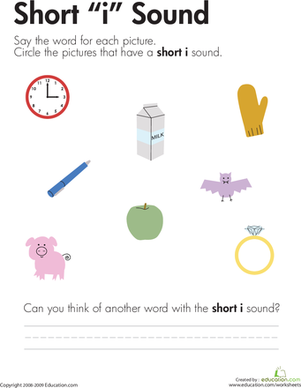 This worksheet will help your first grader get a better grasp of "I" sounds. She'll decide which words feature a long i sound and which feature a short i. How Tall Are They: Coins! What state am I? 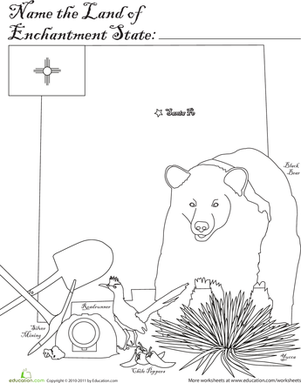 Help your child get to know her country with a mystery state coloring page.